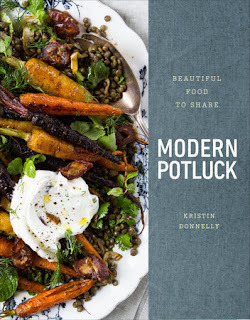 Kristin Donnelly has outdone herself with the entertaining cookbook, Modern Potluck. From the front cover until I turned over the last page, I was impressed with the variety and quality of the recipes provided. Pleasing a crowd has never been easier with appetizers to share to 9 x 13 casserole dishes to devour. I certainly have my go-to dishes that I will bring to a potluck and I am embarrassed to admit that they are not of the most healthy variety. I usually go with a boring dish such as baked mac and cheese. I might spice it up a little and make buffalo chicken dip but again, it is certainly not the healthiest dish out there. I appreciated the pictures in the book and my only complaint is that I wish there were more! It is always inspiring to see the finished product. Some of the recipes I look forward to preparing are the Chinese Chicken Salad, Grilled Corn Salad and Phoebe's Moroccan-Inspired Shepherd's Pie! I highly recommend this book for anyone wanting to branch out into the more healthier options for potluck goodies! Disclaimer: I was provided this book free from Blogging For Books. All opinions stated here are my own.